...those who honorably served and made the ultimate sacrifice...their lives. Memorial Day remembers and honors those who died to preserve the freedoms we enjoy today...Never forget them. I've got to admit; I'm loving this unpredictable, wet, early-spring. This wet weather is really refreshing the entire region. The BT is getting into nice fishing shape. Still a bit high for my liking at 543cfs along the Glenshire stretch and 902 cfs below the LT inflow at Boca. It is remains a sub-surface game. There are few adult bugs in flight, sparse BWO's and March Browns...along with a rare, yellow, leggy CraneFly. Consistent or predictable surface-activity; still remains a minimum of 3-4 weeks away. A good sign from a recent seining reveals a dense population of both Western Green Drake and PMD nymphs. The former being one of the three Big Bugs of June; along with the Winged, Black Carpenter Ant and Golden Stonefly. Before the angling hordes arrive (pre-4th of July), explore the upper river along state-route 89; Tahoe City-Trout Creek; flows out of Lake Tahoe currently at 195cfs. There will be wild, stream-bred trout available ...before they get harvested for the table since there are no gear or size restrictions and five (5) trout take. So, currently, fish the river going down; deep along the bottom substrate... where the fish hold & rest. With the water temps still in the mid-to-high 40's and the occasional 50-51degree (if sun is present) your presentation has to be precise and methodical because the trout will not move much for your offering...force-feed'em. That will change when the water reaches the 55-56 degrees; then the feed-bag is on, whether sub-surface or on top. I haven't heard of 20"+ trout via the local "grape-vine". As far as fly patterns on this river, people know I'm a big proponent of proper presentation & "size matters" first...shape and color to follow, if doable. So select your favorite attractor/impressionistic fly of choice. Remember to "stick & move"...your first good presentation in a new drift being your highest percentage of a take from an opportunistic feeder. The LT below Stampede dam is too low for this time of year at 98cfs. One-fourth the historical 425 cfs release below the dam. I'm attributing these marginal releases to construction raising the dam-face 11'. My main concern right now is how it will impact the PMD hatch/rise activity angling beginning late-June, at its height thru July and into August. The caveat being there will be unseasonal, high releases then... ruining the dry fly fishing! Recently Browns to 21" and RainBows to 19" have been netted. Productive flies have been #16, legged Copper Johns and #18 lime-green, Midge larva. I'm hearing of some selective, surface-feeding (remnant Black Winter Stonefly adults! ), but mostly indo-fishing in the deeper runs & pockets and using dry/dropper rig in the riffles. The spawn seems to be waning...stay away from the redds as the eggs incubate. 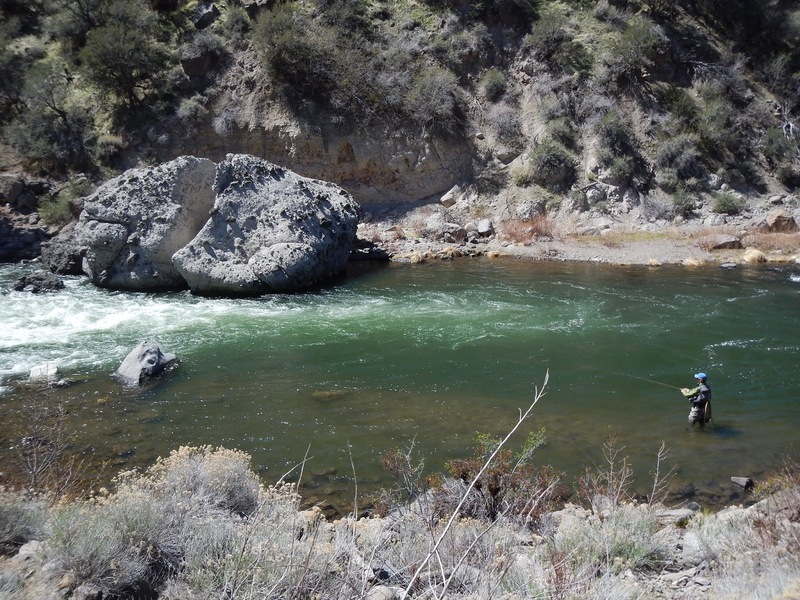 HINT: For eons, this is the time of year we fish the inlet streams into local still-waters. For you creek junkies explore small creeks; remembering that they have a 7-10-day window of prime angling conditions... your chance at "Hat Trick" of Brookies, Rainbows and Browns...a 12incher being a trophy. "Finally, sun and blues skies. This past week we've experienced four consecutive days of late spring snow, cold air & grey skies...Locating "micro-climates" is always good strategy...Be patient for 1-2 weeks, we have both old and new snow to melt. TRUCKEE RIVER is cold; in the high 40's...should improve with the coming sun...The outflow from Tahoe is currently 706cfs. The water is clear, but deceptively deep...From my log: "...lots of water, lots of work, minimal returns". SMALL STREAMS & CREEKS are high & cold; 44-47 degrees,. Most are clear, one remains murky. The small wild trout have fallen for a #12 Yellow Stimulator...trailing a #16 BeadHead Prince. A rare #20 Black Winter Stonefly was viewed while bush-wacking a small brook..."
*This angling report was e-mailed to a over 400 recipients until 2004. It was THE printed angling report featured at ACE Mountain Sports & Hardware Sports.